I visited the Canadian Arctic for the first time in May, 2014. After a day in Iqaluit (Nunavut's capital) I flew to Cape Dorset (pop. approx 1300) at the southern tip of Baffin Island. 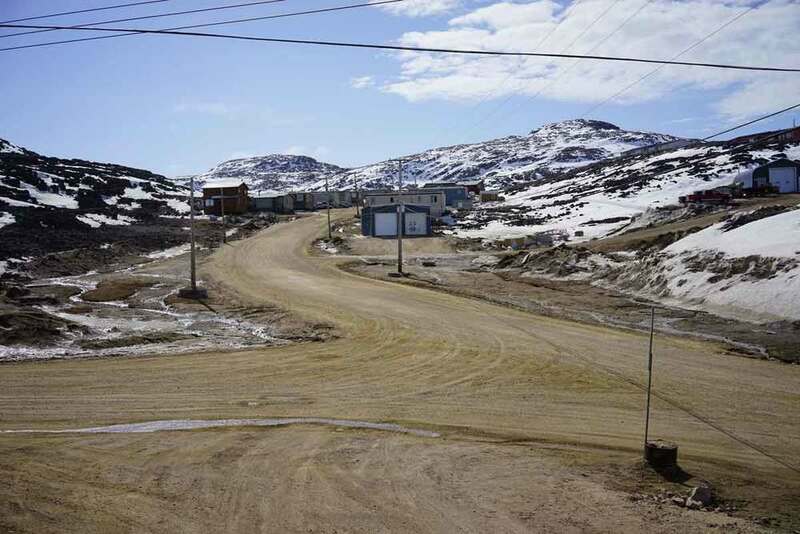 Although the landscape surrounding Cape Dorset is stunning, it was the ochre ribbon-like roads looping through the hamlet, and the constant activity on them, that intrigued me most. Most people walk or drive ATVs (skidoos in winter) to socialize, shop and work. There are few larger vehicles, but the school bus seems always on the go, as are the trucks that deliver fresh water and empty the septic tanks. Thus my first steps out on the town (well, hamlet) were a delightful contrast to my city experience, where the roads are hectic and the sidewalks empty. Next to my hotel (Dorset Suites), and across from Tellik Inlet, is the world-renowned Kinngait Arts Studio, the oldest printing studio in Canada. The distinctive red-roofed, green and yellow buildings (seen below), have been around since 1957. This summer (2017) work has begun on the new cultural centre and studios. To see larger images please click on the photos below. 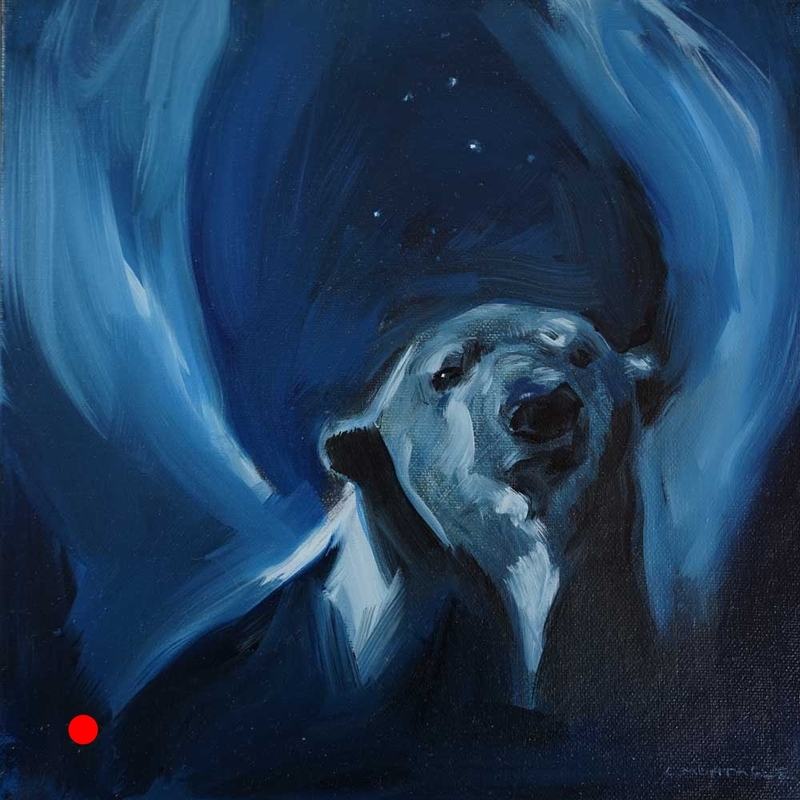 Below:Tellik Inlet by Kinngait Arts. Turn right to go to the two grocery and supply stores, and the RCMP station. Turn left to find the Wildlife Office, the municipal pier, and the gazebo on the hill. The polar bear hide seen above was huge. I mean hair-raising, goose bump inspiring big. I wish I had thought to put my hand or iPhone by a paw for reference. 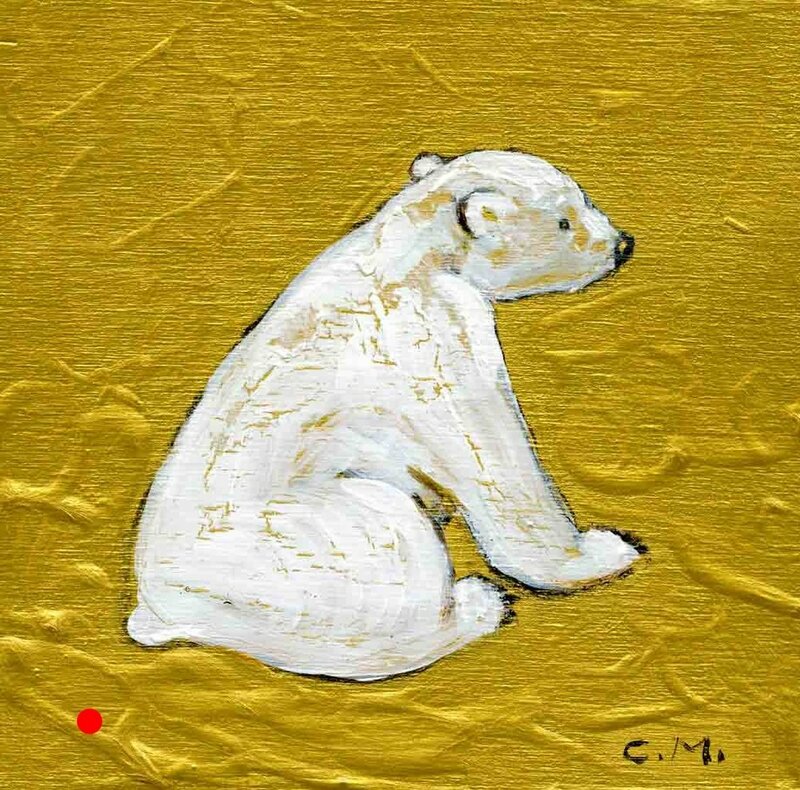 I love polar bears, and my polar bear paintings are portraiture tributes to these great mammals whose future is of concern. But up north? 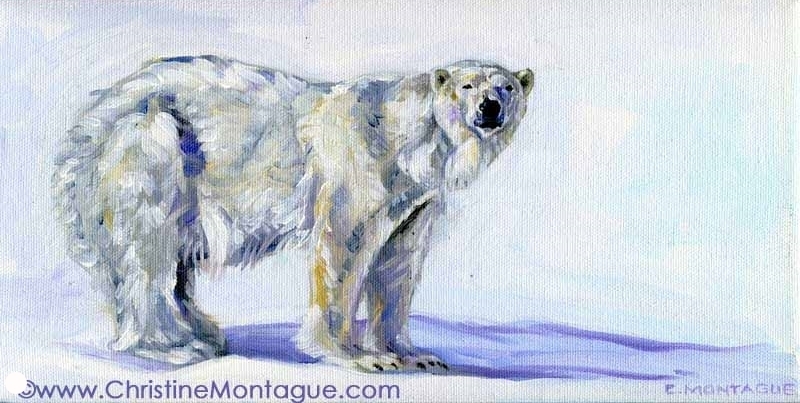 One can never forget these beautiful, intelligent, powerful kings of the arctic are dangerous. So, up the hill to the gazebo. Below. Snowmobilers travel on frozen Tellik Inlet to get to open water beyond. I was forewarned to expect roads thick with mud, but they were dry and solid. Later in summer, when the roads become too dry, passing ATVs and the odd car send up clouds of pervasive dust. But for now, as it was the first week of sunny, cheery weather, children, especially boys, were out on their bikes, pedalling uphill with admirable ease. Note: I use a Sony A7r with 35mm Zeiss lens. iPhone 5s was my back up. In late May 2014, I travelled from my home in the Greater Toronto Area (pop. 8,000,000+) to the Canadian arctic. 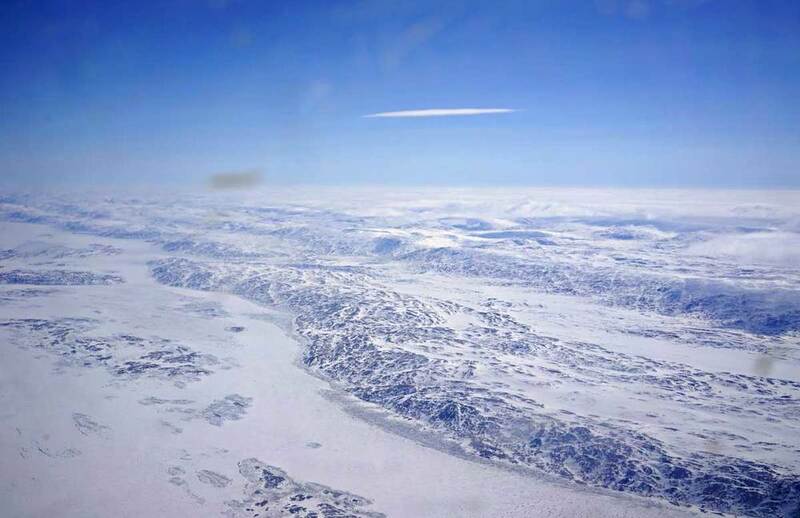 I flew first to Baffin Island in Nunavut, the largest and northernmost territory of Canada. 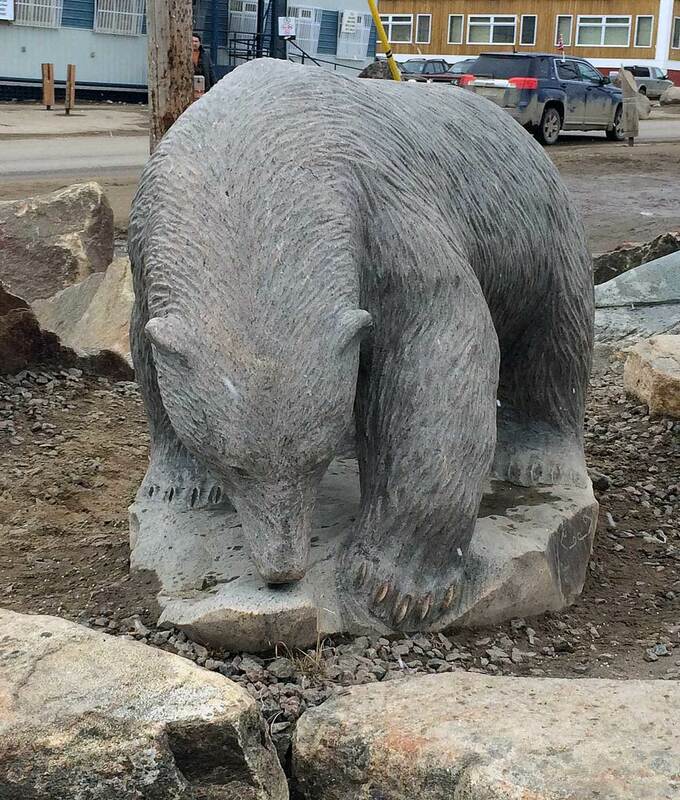 I stayed overnight in Iqaluit, Nunavut's capital, and had a good look at that city's public art (Read Brush with Beauty: Part Iand Brush with Beauty: Part 2.). But my true destination was Cape Dorset, on Dorset Island, near the Foxe Peninsula and on the Hudson Strait. Cape Dorset (map https://goo.gl/maps/Ycjoz) is an Inuit community of about 1300 people (our local high school has more people). The Inuktitut name for Cape Dorset is Kinngait (high mountain) as the hamlet sits by the magnificent Kinngait mountain range. Cape Dorset is the self-proclaimed "capital of Inuit art" and home to the world-renowned Kinngait Studios, the oldest professional printmaking studios in Canada. It is the most artistic community in Canada with over one fifth of the population employed in the arts (printing and carving). 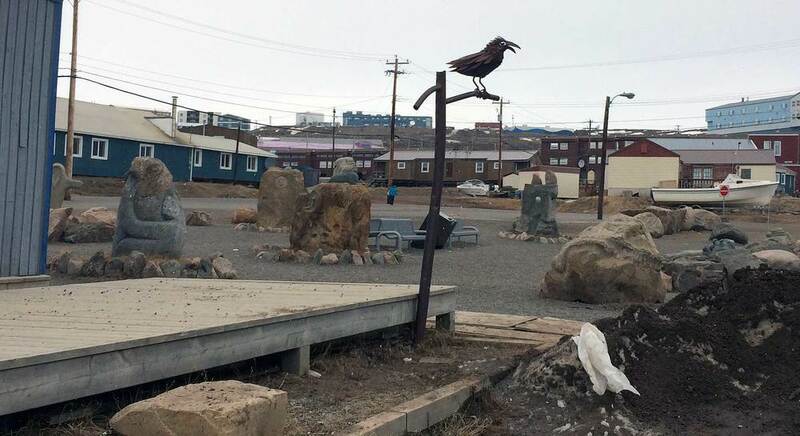 Walk the streets, and it is guaranteed you will meet carvers, either at work in their yard, or on their way to Kinngait Studios to sell the work they've completed. Cape Dorset, on Dorset Island, can only be reached by plane, or when the ice breaks up by ship. The turbo-prop planes of Canada North Air and First Air make the daily flight in (there may have been a merger since I first wrote this?) . Below is a Google satellite view of the hamlet and runway. The narrow grey bar on the right is the small Cape Dorset runway. 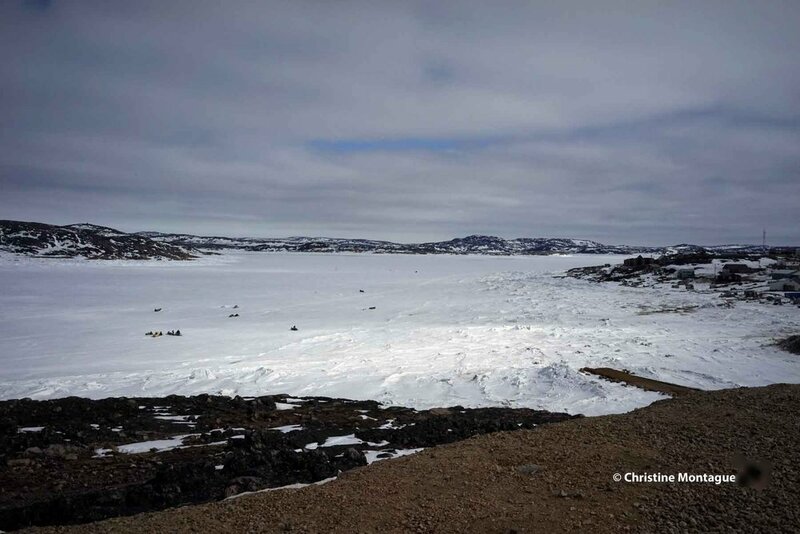 To the left of the runway, are the few roads of Cape Dorset, about 4 kilometres worth. The airplane will only take one try to approach the runway and will return to Iqaluit if unsuccessful. This means sudden fog, snow, and winds blowing in the wrong direction (wouldn't be good to be pushed back into the sea!) can result in the return to Iqaluit. As a newbie to travel in the north, I didn't know to look for the infamous green sticker on my boarding pass. The green sticker, for that is exactly what it is, indicates the airline is not responsible for any expenses occurred when, if turned back, one waits for the next day's flight (or the next day's flight after that, or the next day's flight after that...). Google satellite view of the runway in Cape Dorset. 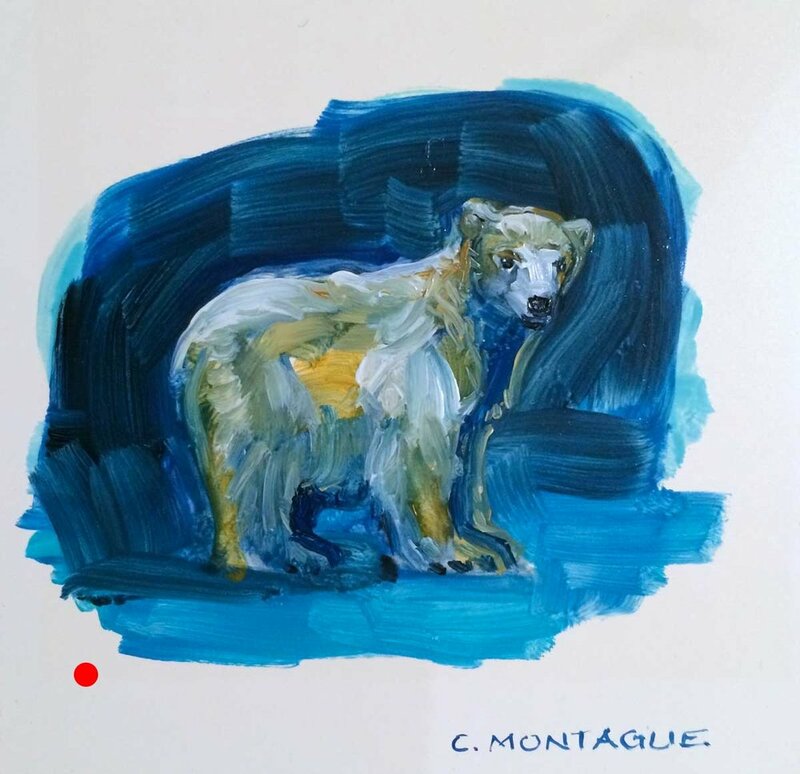 On the late May morning I made the flight to Dorset, I and the other three passengers seated in the sun-filled plane, thought the very personable steward was joking when, as we began our descent to the Cape Dorset runway, he announced we were turning back. Ha, ha, ha...no, wait, you're serious?! A sudden snow squall below made landing risky. The others on the plane, regular travellers to the north, wildly looked at their boarding passes and proclaimed gleefully "No green stickers!". And with relief, I saw there was no green sticker on my boarding pass either. Back in Iqaluit, my good fortune held. The other airline had room for me on their flight that day, and to the relief of the young clerk who had originally assigned me my pass without the sticker, I happily declined the hotel and food vouchers. I like small planes and found landing at Dorset exciting. Like the roads, the runway is not paved, so the surface is rougher. And the wind pushes the plane. I have never been on a flight where the plane wagged (the only word I could think of) as it came to a stop. I am a big city girl who always flies out of Pearson International Airport. Pearson is Canada's largest airport, second only in activity to the JFK Airport in the USA. In 2013, it handled over 36 million passengers. It directly employs almost as many people who live in Cape Dorset and if you include all the other employees at the airport, you have 40times Dorset's population). So, I found it a memorable and favourable experience to disembark a 20 seat plane, have my large luggage in hand, and be on the road to the hotel in about 5 minutes. I shot the photos above about 6 p.m. shortly after I arrived in town. (FYI Nunavut uses EDT in the summer and EST in the winter). The skies were overcast, as they had been apparently for days before my arrival. But when I stepped out the door early the next morning, the weather was glorious! Since my itinerary was to consist mostly of me exploring and photographing the hamlet, alone and on foot, what more could I have asked?! So that first morning, glove and care free, and my Sony a7Rin hand (my iPhone 5S camera served as backup), I turned right at the road towards Kinngait Studios, and the water beyond. I had the sudden good fortune to travel to Canada's arctic in 2014. 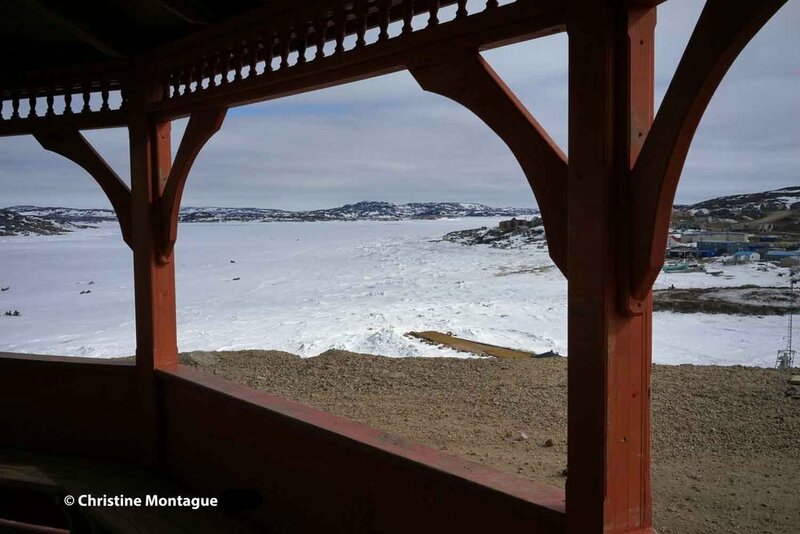 From the Greater Toronto Area (GTA), I flew first to Iqaluit, Nunavut's capital city on Baffin Island, and after a day's visit, was off to Cape Dorset, a hamlet just over an hour's flight away on Dorset Island. My learning curve about Inuit art and culture, the arctic landscape and environment, and how to travel in the north was steep (as was food and travel expenses), but oh, what a wonderful, worthwhile feast for the eyes and mind. One of the many art showcases in Iqaluit airport. 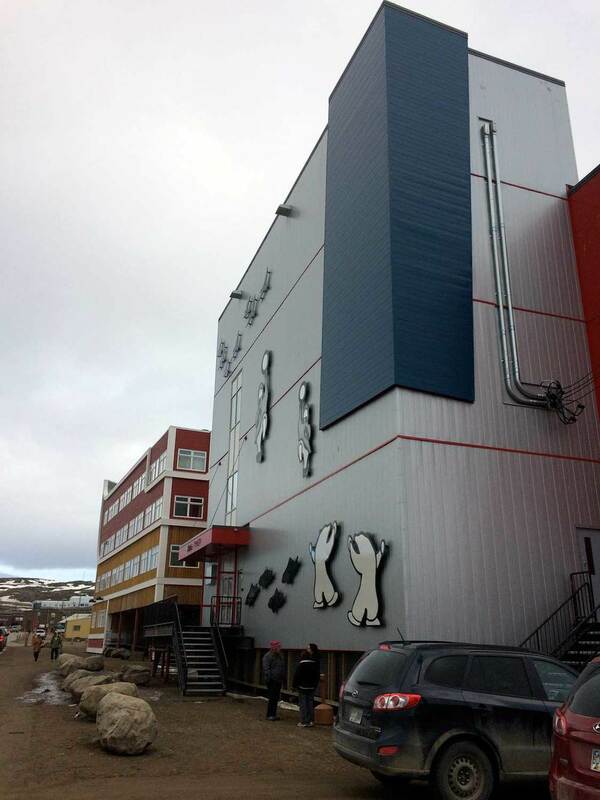 With about 7,000 people, Iqaluit is Canada's least populated capital city. It is the only Canadian capital not connected to any other settlement by road. Travel to Iqaluit is only possible by plane, or if ice conditions permit, by boat. It is a new city, declared such in 2001 after quickly rising from its status as a settlement (1970), village (1974), and town (1980). Iqaluit serves as the gateway to all the Baffin region communities (such as Cape Dorset), as well as to Greenland, Yellowknife, Northern Quebec, Montreal and Ottawa. So it is only natural, that art about the Inuit culture, history and Nunavut's wildlife is evident the moment one steps off the plane. 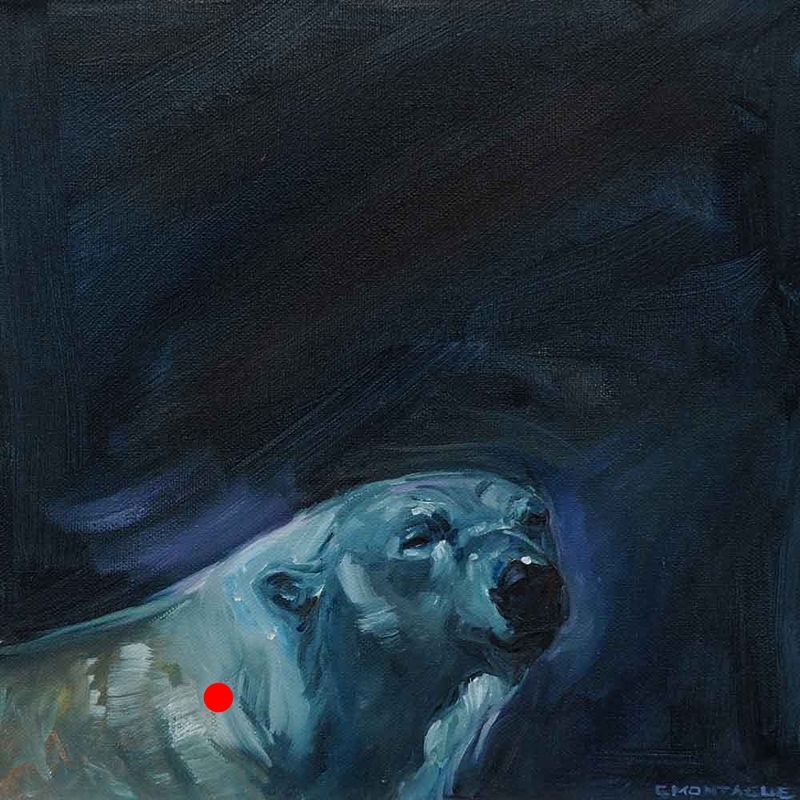 And, yes, like any place that is building a tourism industry, much of this panders to what tourists want, and expect to see - polar bears, inukshuks, and romanticized Inuit life. But, that doesn't mean it isn't a joy to see, which it was, it's just that I expected to find art representing modern-day life in the north as well (note: this may have changed in the past 3 years). Below, is just a sample of what I saw - all in my first hour of strolling through Iqaluit! Me, looking self conscious, but spiffy in my newly gifted hat (made by a textile artist from Pangnirtung). In front of public sculpture. Created co-operatively by multiple carvers. 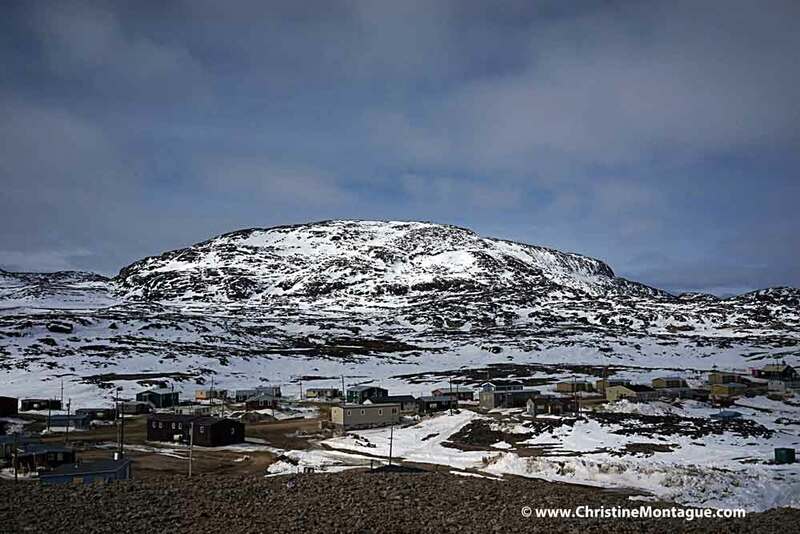 Inspired by family members who loved working in the Canadian Arctic, I jumped at the chance to visit the tiny hamlet of Cape Dorset, Nunavut when the opportunity arrived in late spring (May 2014). My trip wouldn't allow time for me to paint, but there was endless opportunity for me to use my camera (new at the time) the very small, very light, but full frame Sony A7r with a 35mm Zeiss lens. This was also my first camera to have a panoramic feature. It was tempting to make every photo a panoramic one, such was the breadth of the landscape before me. ©Christine Montague Cape Dorset in the evening sunlight. ©Christine-Montague. Kinngait Studios, the famous print shop. Construction begins on the new cultural centre and studios the summer of 2017. ©Christine-Montague_Cape-Dorset-school-bus. Sadly, for the community, the red and blue high school seen on the left, burnt down. A few years ago, I participated in "Following in the Footsteps of Carmichael", an en plein air painting excursion organized by the Art Gallery of Sudbury for the Group of Seven 85th anniversary. The photograph above is of the The Narrows, on the way to Grace Lake where Franklin Carmichael famously painted. If I remember correctly, Carmichael's cottage, which his family still owned at the time, was just to the left past this aptly named spot. And further on, to the right, is the shore where we would eventually disembark to hike up a canoe portage path (bear whistle on hand) to Grace Lake. Not seen in the photo, is the cold rain that horizontally smacked at our faces, and never let up (way to south of us Toronto was flooding). Nor does it tell the story of how, once up the path, the downpour made climbing the rocky vantage point to where Carmichael painted out of the question. Our paths connect again. This Sunday, December 1, 2013, the creative couple are talking about their adventures at the Williams Mill Visual Arts Centre, Glen Williams, Halton Hills, Ontario. For more information please visit www.williamsmill.com A.J. Casson painted in the very picturesque Glen Williams where I once I had my artist studio, and the Learning Centre, where I know you will be inspired by the Waddington's talk, was once my artist studio! Are you a visual artist in the Greater Toronto Area? Here are some 2014 western Greater Toronto Area juried art shows to keep an eye out for in the next few months. It's a little to early for some exact deadlines, but I hope the list below helps you plan for 2014. Good luck, everyone! Spoiler alert! Don't look at the interior photographs of the Small Arms Inspection Building below, if you want to be surprised completely at 2013 Doors Open Mississauga art show and WWII related demos Saturday, September 28, 10 am - 4 pm. This remarkable 144,000 sq. ft. architecture has a rich history involving the war effort (where the Lee-Enfield Rifle was manufactured) , women's independence, and the revitalization of Lakeview, Mississauga (then Longbranch). It sits empty now, but is it any wonder that the space, high ceilings, huge windows and skylights,have inspired plans to renovate it as a world-class arts centre of working artist studios, performance space, art galleries, a museum and coffee shop? To give you a hint of just how dynamic this centre will be, 30 artists (including myself) will show and sell their art. 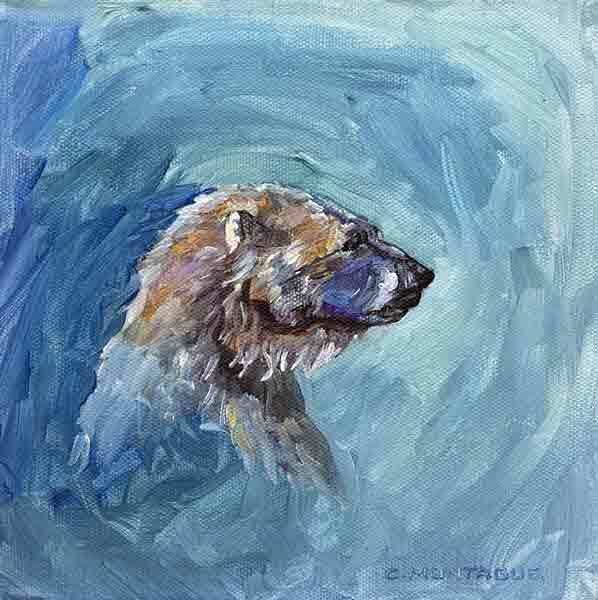 My portraits of people and polar bears will be at the end of the hall on the first floor. Also in the works! Heather Brissenden will sing hits from the Blitz, the Lorne Scots (this was once their home, too) machine gun teams will compete, The Honorary Colonel Gerald Haddon will speak about J.A.D. McCurdy, the Canadian aviation pioneer and much, much more (really!). Have you been to Lake Huron? A stunningly beautiful, dramatic, (and sometimes dangerous) body of water, where any hint of land on the horizon is a mirage. It is the third largest fresh water lake on our planet and the second largest of the Great Lakes. According to a The Beach DJ, empty Lake Huron and all of North America would be in 1.5 meters, or about 5 feet, of water. One look at the expanse of Huron's turquoise waters, not to mention its white sandy beaches (the wilder ones) , transports me someplace otherworldy, and oceanside. Lake Huron is a marvel. This past February, water levels hit a record low, for a number of reasons. The natural cycle of the lake level is a cause, but so also is the dredging done to deepen the shipping channel in the St. Clair River. The dredging has caused the flow of water from Lake Huron and Lake Michigan to accelerate into Lake Erie and Ontario, and to the Atlantic Ocean beyond. The impact? Very simplified: fish population dwindles affecting fish populations, wildlife food chain, sport fishing and fisheries. Water warms up, algae grows. Water lowers affecting water supply to residents, particularly of Georgian Bay. Wishing us all, blue skies and more turquoise water ahead. Recently, I have had access to a small private forest. I set up a motion camera to get a voyeuristic look at the creatures of the night. My real hope was to get images of a coyote in the brush before foliage appeared. I wanted to use this personally obtained reference for a painting about solitude and alienation. For the first month the only evidence of any wildlife was the tiny silhouette of a bat far off in the darkness. At least I knew the camera worked, but I had to reconsider its place. The results? Something more suitable to a children's story. "Mr. Racoon, Mr. Possum and Ms. Cat live Alone in My Forest". I have more animal action in my urban backyard. Recently, when I was able to check out the camera, a new character arrived on the scene. About 20 minutes after Ms. Cat prowled by, this fellow appears, and changes his course to follow what I believe are the cat's tracks. Hopefully, on my next check of the camera, I will see that this lovely fox was 20 minutes too late. 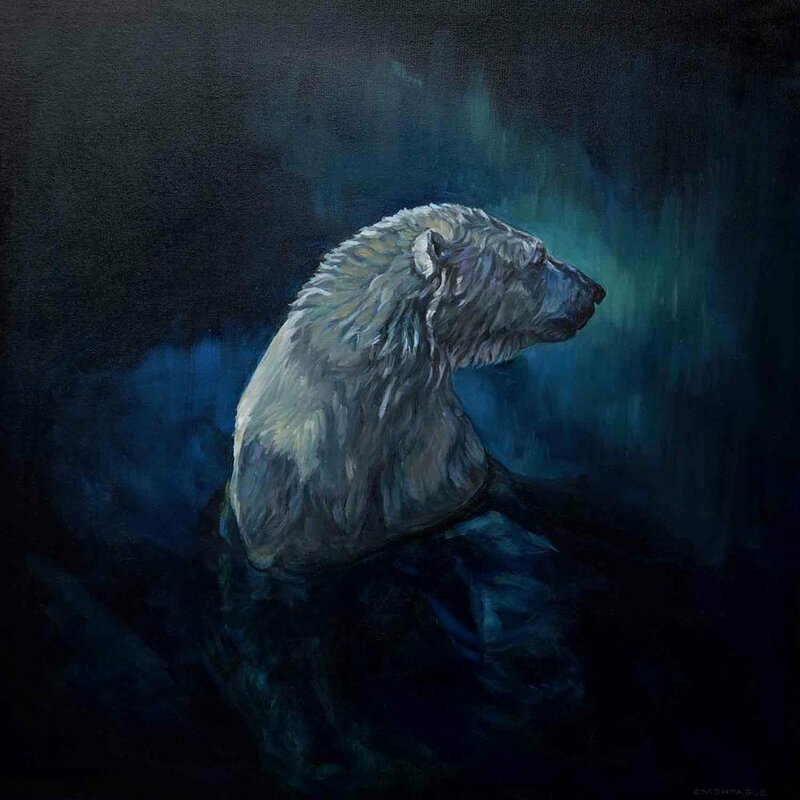 In the last two years, the western Greater Toronto Area (GTA) artist community has lost two annual juried art shows to show their paintings, photography & sculpture. No longer are the Peel Heritage Centre's prestigious annual show (Brampton) and Halton Hills Cultural Centre’s community “The John Sommer Annual Juried Art Show” (Georgetown). Both venues have undergone remarkable renovations in the past two years. The Peel Heritage Centre is now reborn as PAMA. An unexpected donation of an art collection altered the Halton Hills Cultural Centre's gallery’s focus from community-centric exhibition to a more staid model. But take heed; there are still juried art shows to enter in 2013. For some of the shows, it is too early in the season for the posting of exact deadline dates. Thus I have included a "heads up" date based on when the show deadline was the previous year. By the way, there is a lot of discussion out there that juried shows are a "money grab" and other negative thoughts. But juried shows are a very useful tool in your art career strategy. They are one way to build your c.v. when starting out, get a new work or style out before the public, get your work before juror you admire, support your local art community, (club, gallery, or council) and do that all important networking at that opening party, that is, oh, so important (as well as so painful to many of us). And sure, the judging has a subjective element; after all, it’s art! Judges react, just as you would, with their hearts and personal preference, but they also judge with the years of ability for which they have been hired. Most shows hire more than one adjudicator, and I have witnessed first hand, the very careful thought behind the choices. Happy planning & best of luck, everyone! 2013 CALLS TO ENTRY Please remember to check requirements & eligibility. Happy New Year and a January 1, 2012 Thumb Up from Norway! I just wanted to wish you all a Happy New Year! Hot of the presses, I just received this Jan. 1st, 2012 photo of my url www.christinemontague.com from Matt Cook and Sorin Mihailovici, the "dart guys" from Edmonton, Alberta, Canada. 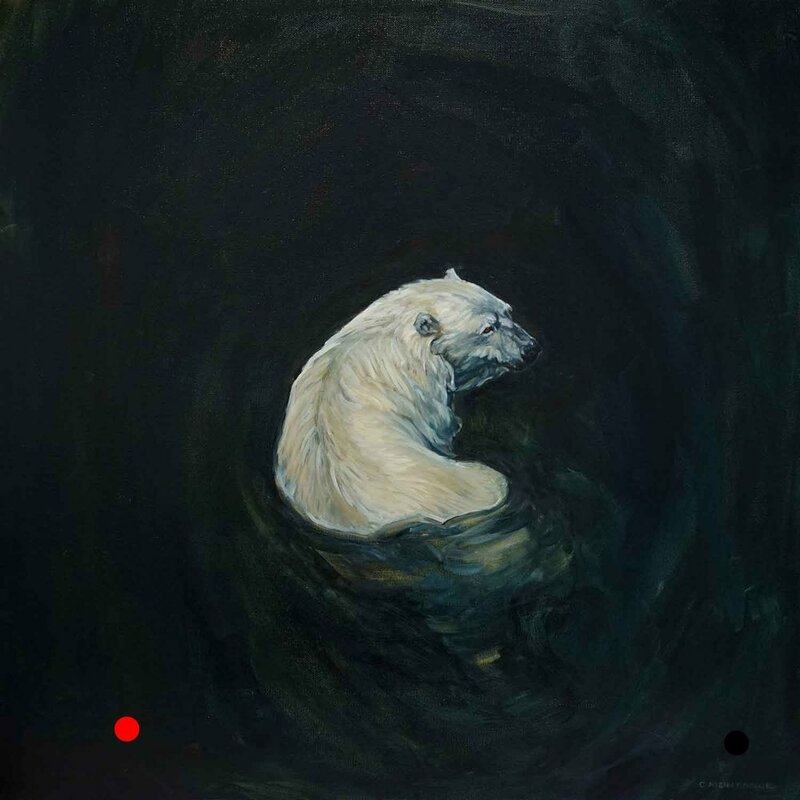 Matt and Sorin, are presently in Svalbard, an archipelago in the arctic that makes up the northernmost part of Norway and where there are more polar bears than humans. It has been 2012 there for a few hours! So why are these two adventurers (who I don't know) holding a poster with my web site markered on it up at Norway's North Pole? 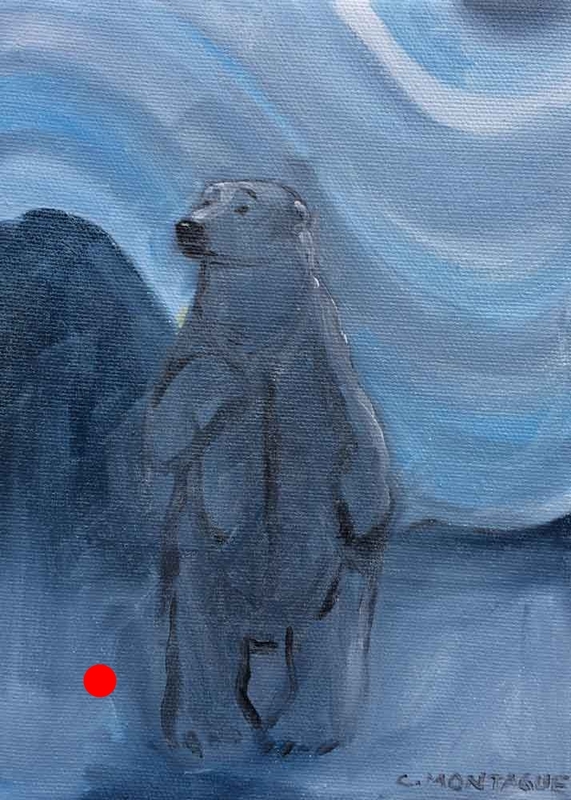 Matt and Sorin are fundraising for the polar bear in a very unique, highly creative and fun way . 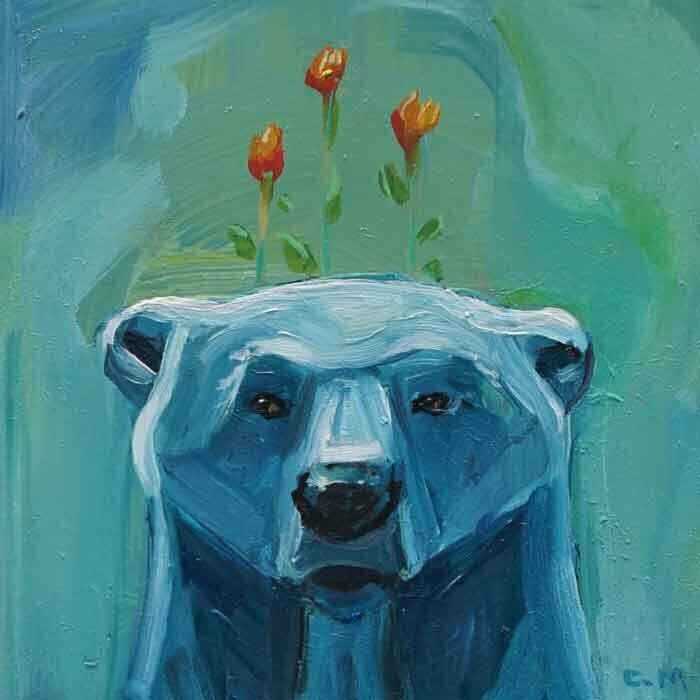 Go to www.polarfaith.com to learn more and to follow their journey. You'll find out why they are called the "dart guys, too! And, If you're like me, you'll envy them , ...um, offer a bit of financial support to their very worthy cause. Wishing you all two thumbs up for 2012 from here in southern Ontario . Not quite as exciting as one thumb up from Norway, but the wish is sincere all the same. Here's the most recent "calls for entry" for visual arts juried art shows in the Greater Toronto Area. I'll gladly post any others you know about. Just leave me a note in comments. Good luck! Deadline January 31, 2012 World of Threads Festival .Fibre Art. http://www.worldofthreadsfestival.com/submissions.html At least seven venues in Toronto and Oakville, including Abbozzo Gallery (Oakville), Joshua Creek Heritage Centre (Halton) and the Sculpture Society of Canada Gallery (Toronto). The past few months have been gloomy, rainy ones in the Greater Toronto Area. So much so, that for the first time ever, my magnolia tree is not in bloom on Mother's Day! The fact that magnolias in this area are always out and sometimes even finished by Mother's Day, inspired me to paint a magnolia portrait entitled, you guessed it, "Just in Time (for Mother's Day")" . The weather today, Mother's Day 2011, is so glorious, the bloom is not off my day, by the lack of Magnolia blossoms. It simply means Mother's Day should be extended a few more days, don't you think? Through my Salmon Run Project, I wish to provoke thought on how urban development has been "built on the backs" of the Credit River salmon. The increase of impermeable surfaces such as roofs, patios, and roads means rain carries debris, oil, gas (from roadways) and silt through the hundreds of Mississauga storm sewers directly into the river. This black and brown water stresses the salmon, kills the insects they feed on and buries their spawning grounds. I will attach miniature houses with acrylic gels (representing tar & oil) in clusters similar to those of an invasive species such as the zebra mussel. These clusters will represent development that has the potential to impede, choke, and threaten the salmon with death, if not controlled. I'm working in a blurb book about a trip to Stephenville, Newfoundland I had in the summer of 2010. This photo of the a bridge at "The Gravels" just beckons one to cross, don't you think? There is a mystery to it, but not a threatening one, certainly not in hospitable Newfoundland. "The Gravels" is a breathtaking walking trail about 15 minutes out of Stephenville, at Port au Port. Lots of tuckamore trees, wild roses, forest, stunning coves, huge fossils in the rocks and a well maintained path to boot. "Recipe for a Good Life" is a beautiful looking cook book as well a source of delicious, nutritious recipes prepared using the key ingredients thought to combat cancer. Paulette Murphy, an award-winning visual artist, and recipient of Brampton's "Artist of the Year Award" is the founder and visionary behind the successful Beaux - Arts Brampton Artists Co-operative . 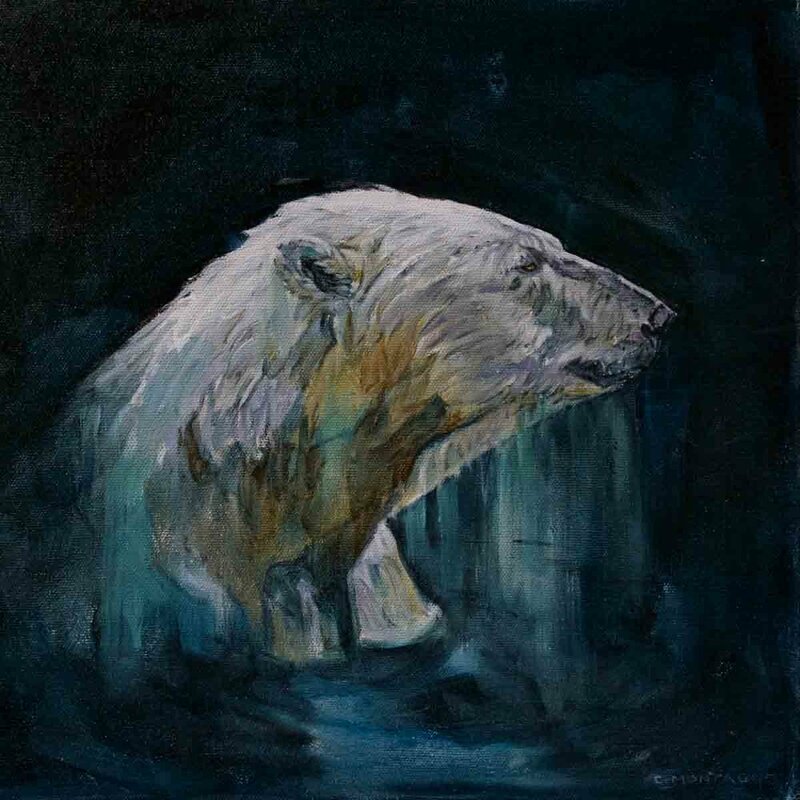 Dawn Friesen is her friend, a fellow artist, and graphic artist working in Brampton. Passionate about good health, proper eating, and art, as well as having a personal connection to cancer, the two artists conceived of a book combining this insight. They put a call out to their large network of artist friends for art work and favourite recipes using the anti-carcinogen ingredients . 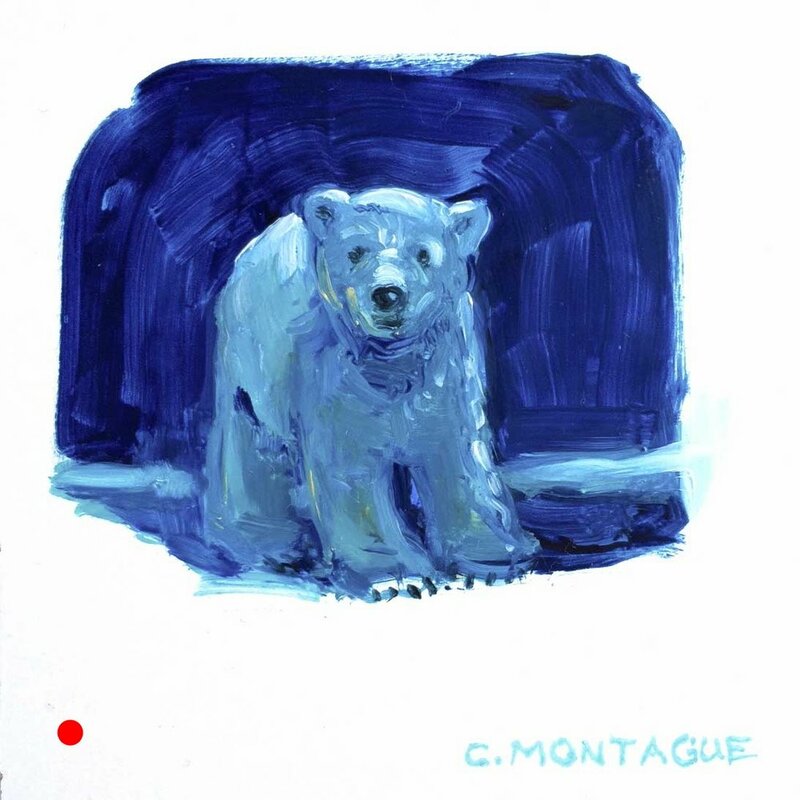 The art work of three Williams Mill artists - Christine Montague (me!) , Sheri Tenaglia & Eileen Millen - are included in this book. My mom's fish bake recipe is also in the book. This attractive book is ideal for art lovers, foodies, and those in search of a yummy and nutritious recipe. All recipes have been tested by a nutritionist. Only $25 - a portion of which goes to charity. You can see and buy this terrific cooking & art book in Sheri Tenaglia's studio in the Yellow Mill, Williams Mill. OR scroll down for some other locations. www.friesenpress.com/bookstore/ Located in both the art and the cooking sections. FYI There is no personal connection between Dawn Friesen, the author, and Friesen Press. Being a visual artist in Canada is a rough haul, but there are certain wonderful people one meets along the way that lighten the load, and encourage the journey. There are also certain art shows and venues that enlighten the path. Here's how an upcoming art show, A Lasting Gift: The John & Gisela Sommer Collection January 8th - Feb 6th (Opening Jan. 16th) carries the five fold whammy of John & Gisela Sommer, The Sommer Collection, Art Gallery of Peel, Sybil Rampen, and Joshua Creek Heritage Arts Centre. For many years, Georgetown's John and Gisela Sommer have been enthusiastic supporters of visual artists in the GTA*, particularly in the western region of Halton Hills and Peel. Many a visual artist has been the lucky recipient of their generous support either in word or deed. The Sommers not only collected art, they exhibited it at Gallery Sol, their home turned gallery, in Georgetown, Halton Hills, Ontario. 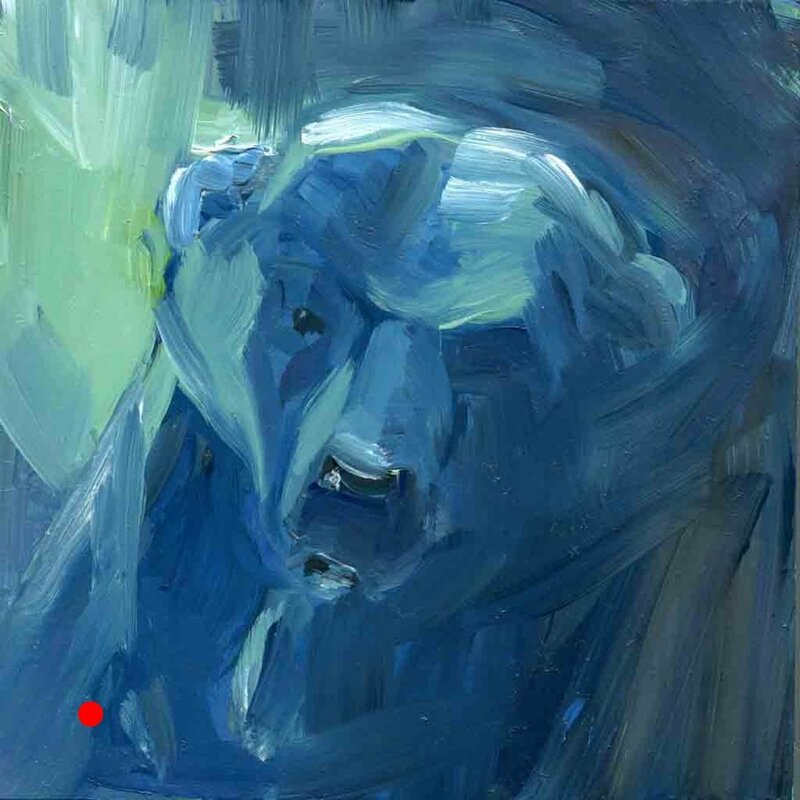 I first met John, when, as juror, he awarded my painting Top Award at a juried art show. A few months later, I discovered that this soft-spoken and lively gentleman, and his charming wife Gisela, were popular visitors at the Williams Mill Visual Arts Centre in Glen Williams, where I just opened a studio. John often made reference to the Gallery Sol, which was, at that point, after decades of being open, was winding down. My mistake was in assuming it was a showcase for regional artists. What I didn't realize was that the Sommers had an incredible collection of contemporary printmaking, painting, sculpture and photography that included Andy Warhol, Jack Chambers, Leonard Hutchinson and David Hockney. Luckily, I will get a another chance to see this art, and so can you! The Sommers have recently generously donated their art collection (ensuring their legacy as well as that of many regional artists) to The Art Gallery of Peel (Peel Heritage Complex, Brampton). This art gallery, in the midst of transformation into a remarkable new venue across from Brampton's Gage Park, is temporarily closed. Until then, 200 of these art works will be on exhibition at Joshua Creek Heritage Centre in Oakville, Ontario. The grand opening of this art show and opportunity to meet the very wonderful John & Gisela Sommer is Sunday, January 16, 2011, 2 - 4 pm. Joshua Creek Heritage Centre Gallery . Click here for map. Oh, and as for Joshua Creek Heritage Centre, and artist & visionary Sybil Rampen, who created it, that my friends, is a whole other incredible story of inspiration, generosity, and legacy! Click here to read more.